We’ve all done it. We’ve made a big cross stitch project and happily taken it to the framers, only to find it will cost more than $100 to frame it. An inexpensive alternative to framing is to make a pillow out of your needlework. It’s quick. It’s easy. And it’s a lot less expensive than framing. A quick note about fabric: I like to use 100% cotton fabric. I find it very easy to work with. How much fabric you will need depends largely on the size of your finished project. A smaller project may only require ¼ yard, but you may need ½ yard or more for a bigger project. 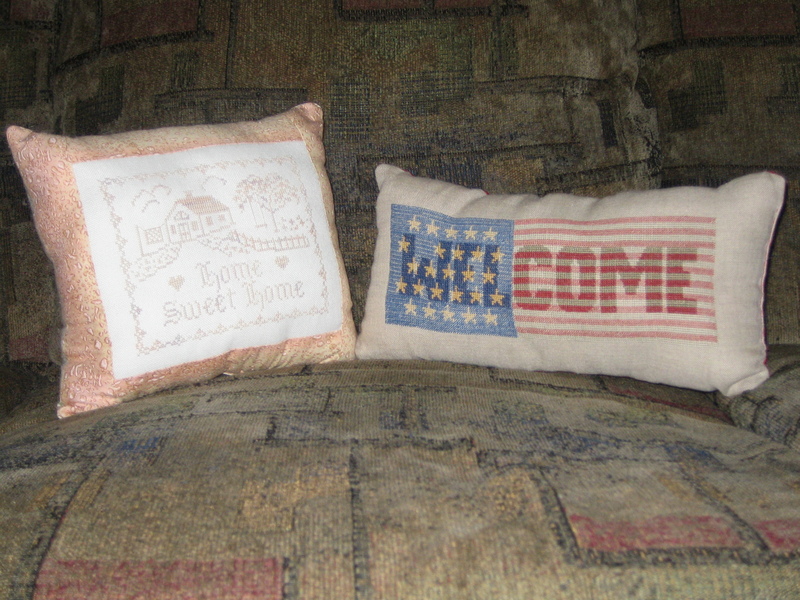 This is a picture of two of the pillows made by Pam, one of each style explained here. Using a ½ inch seam, sew all the way around the pillow, leaving the opening un-sewn. Turn the pillow right side out and push out the corners. Stuff the pillow with fiber fill and sew the opening shut. It’s easier to do this part by hand. This is the method that I prefer. You can use the same fabric for the borders as you use for the pillow back, or you can use two different fabrics. It all depends on what you like.The first thing you need to do is decide how wide you want your border to be. Remember to cut it 1 inch wider as you will lose ½ inch on each side for the seam. Cut your fabric to the desired width. Measure the length of the top and bottom of the aida. Cut two strips of fabric this same length. Pin to the top and bottom allowing ½ inch for the seam and sew the fabric to the aida. Press the seams so they lay flat. Measure the sides of the pillow top, including the borders that have now been sewn on. Cut two strips of fabric equal to the sides of the pillow top. Pin into place and sew. Press the seams so they lay flat. Now the top of the pillow is done. Cut a piece of backing fabric the same size as the pillow top and lay them on top of each other, good sides together. Pin the two pieces of fabric together on three sides and most of the fourth. Again, you’ll need to leave an opening big enough to get your hand into so that you can turn the pillow right side out when you have finished sewing it. These are great projects because you are limited only by your imagination. Try sewing buttons where two seams meet in the corners. Add some cording to a small pillow and you have a decorative pillow to hang on a door knob. Try it and see what you can come up with! Pamela Cirincione is a stay at home wife and mother to two little boys and an avid cross stitcher for many years. This was really helpful thank you! I’ve been wondering what to do with all my unframed cross-stitch for ages. Great instructions. I just learned how to use our sewing machine 2 days ago and today I made a cute pillow from my cross stitch. I’m going to be saving lots of money making my own pillows and also some for gifts. I think making pillows is an interesting possibility, but there are some downsides, one of which is that after all that work your pillow can and will get dirty, possibly stained, and worn. In defense of framing, I wanted to say that it can cost a lot, because custom framing requires a great deal of labor, especially needlework projects, they need to be stretched, mounted, and are more difficult to assemble (I am a framer). I also want to say that it is well worth paying for custom framing as so many things you buy are gone in a week, or a month, or even right away (food LOL) — framing lasts literally forever, even into the next generation. You must think of it that way. Get the best framing you can afford, pay for it 1/2 now, 1/2 later, but if you frame it do it well. I can tell you that I have framed my pieces and even those that I framed years ago are so lovely because I took the care and spent a little extra to get good glass, custom frames that really complement the piece and they are a part of the enjoyment of my life. I am quitting framing because I cannot make any money after overhead costs, framing does cost a lot but we framers labor long and hard to make pieces for you that will last a lifetime. Make some pillows, but don’t scrimp on the framing of a piece you’ve put your heart into, it is so worth it. That’s so funny I went to look at this article and immediately noticed our very similar names! I’ve never known anyone outside my family with any close variation of the name. Followed your instructions for a bordered pillow. Came out great. I didn’t want to frame this cross-stitch, so the pillow saved it from being stored in the closet in a bag. Look forward to making more cross-stitch pillows in the future. I find using fiber fill causes a lumpy looking pillow. I prefer using foam pillow inserts but am unsure what size to use. I have an 8×12 cross stitch I want to make into a pillow. What size form should I get? Maybe get a 12 x 12 and add some fabric to the sides of the pieces to make it square?